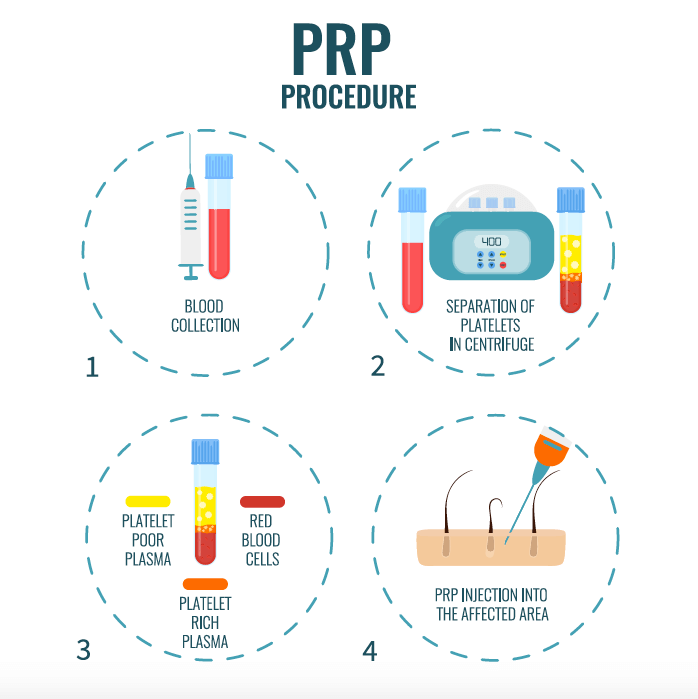 PRP treatments have been steadily gaining popularity since the early 1990s because they help boost the body’s healing process in a more natural way. Recently, PRP has also begun to be used more specifically for cosmetic treatments such as hair restoration, skin rejuvenation & wound healing. As physicians continue to explore this treatment option, it will undoubtedly be used more widely. PRP can be beneficial for a variety of skin concerns as well as for thinning hair. The treatments are performed in a series of sessions and may be done alone or in conjunction with other procedures. If you’re wondering if this treatment option is right for you, we recommend that you schedule a cosmetic consultation. PRP treatments are rather simple! For facial treatments, we’ll start by applying topical numbing cream to the skin. For thinning hair, we’ll use an ice pack instead. While your skin is numbing, our nurse will perform a blood draw. Next, your sample will be spun down in a centrifuge. This process separates the platelets into the plasma, creating the PRP used for your treatment. Once the PRP is processed & ready, the doctor will begin your injections/application. For hair restoration, injections are placed directly into the thinning areas of the scalp. For skin rejuvenation, the PRP may be injected or it may be applied to the skin in addition to microneedling and/or other procedures. What are the side effects of PRP? Any downtime? Side effects are minimal. Of course, with injectable treatments, there’s always a potential for bruising, redness and/or skin irritation. These side effects are generally manageable and will resolve in the days following your treatment. Since PRP is derived from your own blood, the risk of an allergic reaction is extremely rare and unlikely. Lastly, there are no activity limitations after this treatment. However, in order to limit the risks for bruising & swelling, we recommend avoiding alcoholic beverages and intense exercise in the first 24 hours following your treatments. When will I see results from PRP? We’ll make a recommendation on the number of sessions needed based upon your skin & the desired outcome. However, some results are noticeable about 2 weeks after each session. Since this treatment relies on your body’s natural healing processes, improvements will certainly take some time. In fact, optimal results are almost always reached about 3 to 6 months after completing the entire series.